Basically, Relational Aesthetics is when someone with an MFA wants to meet new people but because they spent all that time pursuing an MFA, they don’t know how to talk to people normally. And they got really poor social skills. And they can’t find no other way to meet new people other than forcing them into odd activities at their own poorly attended art openings. Relational Aesthetics is also when a successful artist who is too busy touring the globe going from biennial to biennial and they have no time to make physical art objects anymore so the famous artist uses the attendees at the exhibition as the artwork in some ways, na whut I’m sayin’, to explore the social relationships between people. Youngman’s choice of the Internet as a means of connecting with the world exemplifies the Internet’s global reach. The question that comes to mind involves how we see and experience art virtually (online) without specific references (i.e., a vlog entry with a discernible human face) and how artists and writers are defining it as art. From Muralism to Performative art, the physical public space has served as a forum to create work utilizing people and physical environment as a context for the pieces themselves but what considerations ought to be made to distinguish virtual performance as art? With the undercurrent and burgeoning of open source programming and a multitude of sites and blogs catering to ever type of human need imaginable, how does the new media artist discern oneself as an artist without having to subscribe to the sensibilities of tradition? What are the various forms of documentation or absence of documentation that include virtual Performative art as a part of art history and its evolution? Joseph DeLappe provides an interpretation of online performance art that serves as art with civic action in mind. 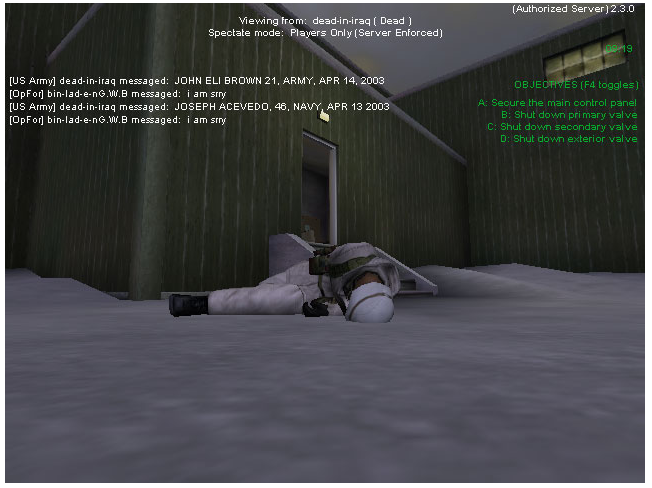 Joseph DeLappe’s piece, ‘dead-in-Iraq’, utilizes the virtual environment of ‘America’s Army’, which is the United States Army’s recruiting game. The virtual role-playing game is open to anyone interested in establishing an online account and perhaps possesses a profound interest and curiosity for the military. The game itself simulates the actions and consequences of war. Allowing for fantastical play where the player has endless lives and has the ability to kill enemies and, perhaps, even soldiers in their own platoons with the absence of admonishment, the end user’s thoughts and emotions translate and weave themselves into a collection of memories that are both real and imagined. A simple game and task at hand, yet, the underlying message remains the same, and you are a machine. The human self morphs into a virtual killing machine (in the literal and figurative sense) and DeLappe’s ongoing piece goes above mere performance, there is a universal message of conjuring up the fallen. Those individuals without an avatar and no(body) to represent them. DeLappe crosses over into a space that is real and unreal simultaneously and the young men and women either pay attention and act aggressively or stop and wonder what DeLappe is trying to prove. His method is simple. He types the names of dead soldiers from the Iraqi War until ‘friendly’ fire or enemies kill him. There is virtual/imagined surrender to a certain extent, which would be unfathomable in real life. DeLappe utilizes the virtual space as a form of protest. There is a front facing insubordination each end-user receives and experiences unknowingly. By the artist refusing to play the game they are putting themselves on the frontline with the intention of disobeying the rules with purpose. DeLappe’s abeyance of the gameplay is the art and the other virtual soldiers take place in relaying the message. Obviously, if a million people were to re-blog or tweet the happenings of such activity, would there be a proliferation of similar action? A resistance by the masses? Or, is this a form of expression and performative virtual aesthetic action only to be performed by the Artist? We have yet to see. Posted in Art and Technology, Culture Criticism, Performance and Conceptual, Social Networking, Theory and tagged as arts and technology, conceptual art, conceptualism, gaming, joseph delappe, performance art, postaday2011, relational aesthetics, simulation, virtual performance art.